A beautiful Steampunk Victorian boot. With its screw rivets embellishments and criss cross trim detailing it is versatile and complimentary to many an outfit. The heel height on this 20 eyelet boot is 2.5 inches. A must for any vintage style ensemble. You might need to order a size larger than usual as these boots run a tad small- also larger calf-ed individuals might have some difficulty fitting comfortably although there is some room provided in the lacing. Otherwise, these are officially my favorite pair of shoes. I find them well-made and quite comfortable. 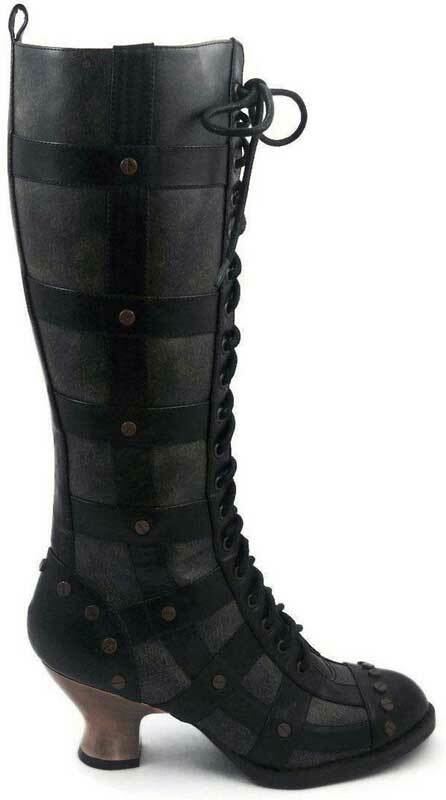 I would highly recommend these boots to complete any sort of goth or steampunk wardrobe.